Currently the third most-planted variety in region, behind Meunier and Pinot Noir, Descôtes said at a lunch in London last week that Chardonnay would overtake Meunier in the near future, such is the growth in plantings of this white grape. 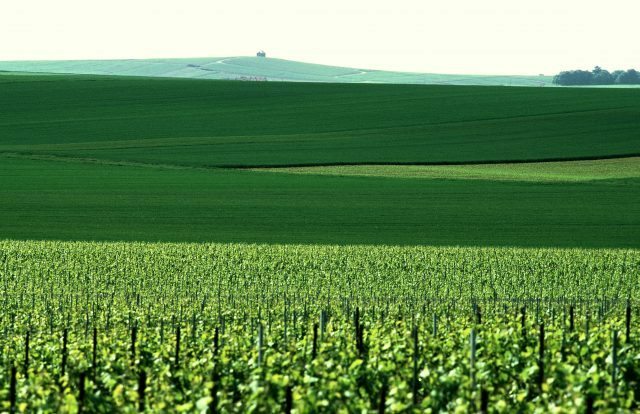 Although Champagne’s 34,000 hectares are fully planted, Descôtes said that growers who choose to replace vineyards are opting to replant them with Chardonnay, both because it is increasingly popular with consumers, but also due to the fact it provides more regular yields. “Growers are replanting with Chardonnay because it gives better average yields [than Meunier or Pinot Noir] and there is a trend for Blanc de Blancs,” he said, referring to Champagne made with just white grapes. Then he said that the rate of replanting is accelerating for two further reasons, the first of which is due to the age of vineyards in Champagne. Although the current average rate of vineyard renewal in the region is just 1% of the total area every year, Descôtes said this will speed up as vines planted in the early 90s – when there was still new land to plant in Champagne – are now starting to become less productive with age, encouraging growers to remove them. Although low-yielding old vines may be preferable for the production of concentrated still wines, in Champagne, growers want large yields per hectare, which vines over 25 years-old, depending on their condition, may struggle to provide. 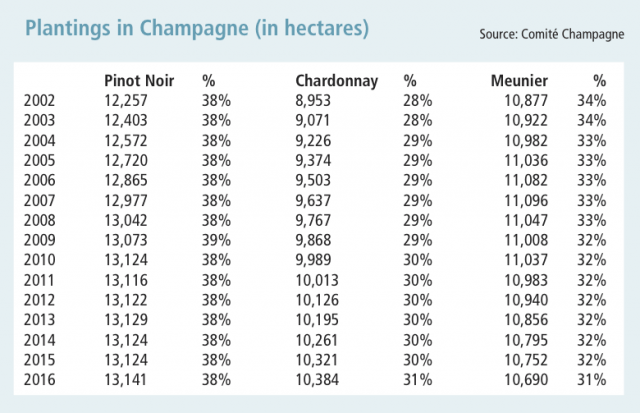 (The average yield in Champagne is around 75hl/ha). Secondly, the rate of change is rising due to a recent change in the rules in the region. “Plantings of Chardonnay have slowly been increasing over Meunier, but that will accelerate because of a change to the rules in Champagne, which now allows producers, if they take out a vineyard, to take wines from their reserve,” he said. “With this change there will be no loss [in production from vineyard removal] and so I think Chardonnay plantings will come on faster, that I’m sure,” he said, pointing out that there is at least a two-year period between planting new vines and producing grapes from them. In other words, producers can compensate for the lost grape supply by using more of the wine that is held back from previous harvests, known in Champagne as the réserve qualitative individuelle, and, like yields in the region, the amount of this wine that can be used on an annual basis is strictly regulated. As previously reported by the drinks business, such is the demand for high quality Chardonnay grapes in Champagne, some producers have reported a shortage of the variety. During an interview with db in Reims at the start of this year, Frédéric Dufour, who is president & CEO of Ruinart, said that the supply of Chardonnay was limiting growth for the house, describing the grape as a “precious raw material” in Champagne. “The hardest grape to get is Chardonnay, because even if you have Pinot Noir, you need Chardonnay, and Chardonnay is the least planted grape [in Champagne],” he said. As a result, currently, Descôtes confirmed that the highest grape prices in Champagne were “definitely” for grand cru Chardonnay – with producers paying as much as €7 per kilo of grapes, or more, for this variety grown on the region’s best sites: the chalk slopes of the Côte des Blancs. The increasing demand for first-rate Chardonnay has also encouraged growers and maisons to look for new sites for the grape outside the famous Côte des Blancs. Among these are the Côte de Sézanne, and the Côteaux de Vitry, which Descôtes said “are very expensive now”, noting that Chardonnay prices in these areas, prized for their chalk outcrops and south/south-east facing slopes, are now reaching around €6.40 per kilo, the equivalent of premier cru grapes from the Montagne de Reims. Indeed, as reported by db in May this year, grape prices are rising faster in Vitry than any other part of Champagne, including the grands crus. Finally, the scramble for Chardonnay in Champagne may also be connected to increasing ripeness levels among red grapes in the region. Earlier this month, Gosset cellar master Odilon de Varine said that more Chardonnay was needed in Champagne to offset the increasingly ripe Pinot Noir and Meunier. Chardonnay brings “more freshness and salinity” to blends, he said, noting that this was necessary to compensate for the “soft” wines from red grapes grown in Champagne – which, he added, was a result of changes to viticultural techniques in the region. “We need more Chardonnay to provide a backbone,” he stated. The fact that this year’s harvest in Champagne favoured Chardonnay over other grapes, particularly Meunier – which was badly affected by a wet and warm August in the region – may further accelerate the move to plant more Chardonnay at Meunier’s expense. Over the past 15 years, the area of Champagne planted to Chardonnay has risen by 16%, while plantings of Meunier have gradually declined. (See figures below, taken from the June edition of the drinks business, which contains an in-depth feature on Chardonnay in Champagne). For me who loves blanc de noir this is bad news. not really a fan of blanc de blanc.